Zen has been called the study of silence. “We need silence,” writes Zen master Thich Nhat Hanh, “just as much as we need air, just as much as plants need light.” But how, exactly, are we to study silence? By what means can we cultivate its nourishing presence? Just be quiet, one is tempted to suggest. Just be still. But in a world rife with noise and distraction, that choice may no longer seem plausible–or even very desirable. In her book Reclaiming Conversation, the sociologist Sherry Turkle reports that many of the people she has interviewed, particularly young people, have an aversion to silence, finding it merely boring. They would rather go online. And as Thich Nhat Hanh observes in his book Silence, many of us are afraid to sit quietly, doing nothing. By keeping ourselves ever-busy and ever-connected, we avoid such negative feelings as loneliness, restlessness, and sadness, which can become all too present when we are silent and alone. If we wish to study and cultivate silence, it would seem, we have first to overcome our resistance, whether it be grounded in aversion or fear. Having accomplished that first step, we may also need to revise our concept of silence, which is often viewed as an absence of sound. It is difficult to contemplate an absence, much less an absence as abstract as silence. Father Richard Rohr, a Franciscan priest who has written extensively on this subject, urges us to grant silence an “ontological identity,” which is to say, to view it as having a real and even palpable presence and a being of its own. Rather than conceive of silence in terms of what it is not, we can concentrate on what it is, whether the silence we are contemplating is external or internal: the silence immanent in our surroundings or the silence deep within ourselves. As our daily experience will readily attest, external silence can be hard to come by. Libraries and doctors’ waiting rooms are no longer silent places, and the once-quiet lounges of American airports are now polluted by voices on cell phones and the endless drone of CNN. And that is to say nothing of the ambient commercial music in malls, restaurants, shops, and public spaces. The physicist George Prochnik, who studies acoustic phenomena, believes that as a culture we are currently experiencing an “epidemic of excessive acoustical stimulation,” much of it injurious to our health and equanimity. “Noise,” he laments, “is defiantly on the rise.” Conditioned if not exhausted by the din in the public arena, we may need to remind ourselves that in our private domains, silence is still an option. Laptops, TV’s, mobile devices, and even noisy appliances can be turned off. Idle chat can be held in abeyance. And should we wish to experience sustained periods of silence, we can seek out quiet places. We can take a walk in the woods, or attend a Quaker meeting, or commit to a silent retreat. Silencing our inner noise is another matter. Once we have found or created a silent space, how are we to silence our interior monologues, which can be as loud or louder than our surroundings? Methods vary, but in my experience one of the most effective ways to quell our inner noise is to shift our orientation from our hyperactive minds to our oft-neglected bodies. This can be done while engaging in physical activity–walking, swimming, yoga, T’ai Chi–but it is most readily accomplished by stopping whatever we are doing and sitting still, our spines upright, our eyes softly focused on a point three feet in front of us, our bodies aligned and relaxed. Bringing awareness first to our breathing and subsequently to whatever physical tensions we may be experiencing, we allow our mysterious bodies to find their own balance. Under such conditions, gaps may open in our unending stream of thought. Quite often, our inner chatter will diminish or disappear of its own accord. If we persist in this practice, lengthening our sittings to thirty minutes or more, we can learn to “protract the gap”: to dwell without fear or aversion in the intervals between our successive thoughts. Recognizing the empty, impermanent nature of our thoughts, feelings, and states of mind, we can release them whenever they are ready to go. By so doing, we not only pacify our minds and relinquish our discursive and often judgmental thinking. We also open ourselves to what the Japanese philosopher Shizuteru Ueda has called the “space of the unfathomable stillness, or absolute silence.” Always present but only rarely acknowledged, that deeper silence nourishes and sustains us. And when, as we must, we reenter the realm of thought and speech, it endows our words with depth and meaning. Sherry Turkle, Reclaiming Conversation: The Power of Talk in a Digital Age (Penguin, 2015), 38f. Thich Nhat Hanh, Silence: The Power of Quiet in a World Full of Noise (HarperOne, 2015), 22–24. Father Richard Rohr, “Finding God in the Depths of Silence,” Festival of Faiths, May, 2013. George Prochnik, In Pursuit of Silence (Anchor, 2010), Kindle edition, 235, 289. Shizuteru Ueda, “Silence and Words in Zen Buddhism,” Diogenes, no. 170, vol. 43/2, Summer, 1995. 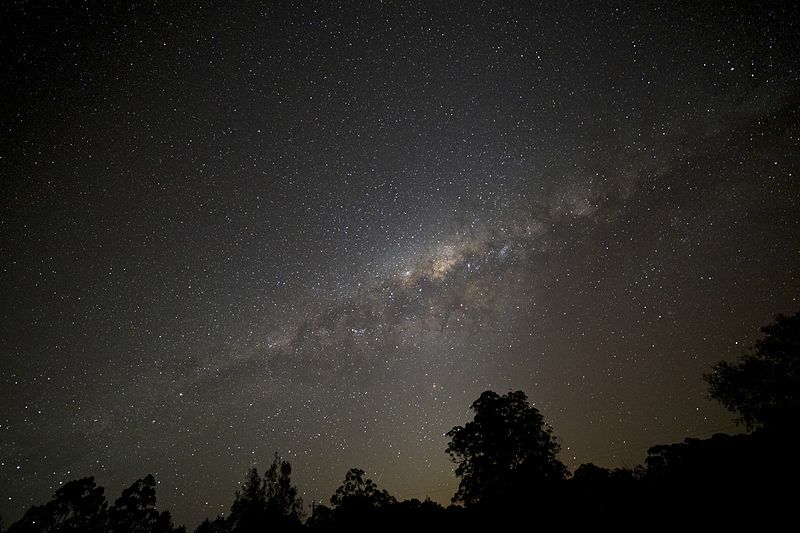 Photo: “Milky Way viewed south of Sydney, Australia,” by R. Scott Hinks. After 40 years of sitting in a silent Quaker meeting regularly, probably averaging once a week, I find it amazingly easy to sit down and slip into a relaxed silence. This is one of the greatest gifts of my life. Thanks for your comment. You are indeed fortunate to be have this capacity. Is the presence of others an essential condition?